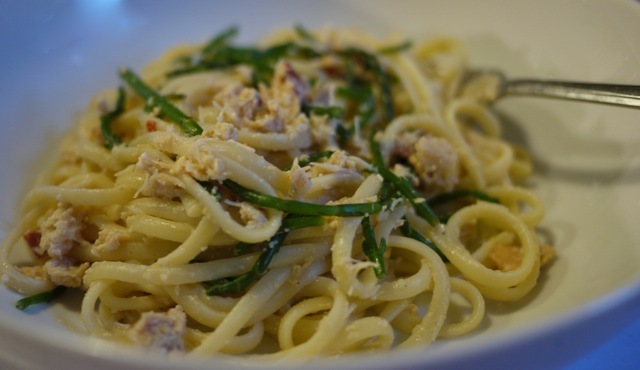 Samphire and crab – perfect marriage of taste and texture. I’ll keep my eye out for samphire so I can try this lovely pasta dish. .-= fran´s last blog ..Viva Mexico =-. This looks delicious. I love samphire, and crab for that matter. You’ve made me hungry! .-= Whimsical Wife´s last blog ..Great British Seaside =-. Hello there, just recently found your website through GoogleNews, and been coming back a lot. You have a cool site! Would you mind if I link to it from my Website at this page? Next Next post: Use yer loaf….